Fish pie is a classic of English cuisine – and this delicious pie is an easy version of the classic. If you want to add in more fish or substitute the salmon in the recipe for what is available in your area, feel free. Preheat the oven to 180C. Grease a medium baking dish. Finely slice the onions into half-moons and roughly chop the fish. Roughly chop the potatoes. Place the potatoes into a saucepan filled with cold salted water. Bring them to the boil and cook them until tender and able to slide off a fork, around 15 minutes. Once cooked, drain them and place into the baking dish. Meanwhile, cook the onions with a little olive oil until softened, around 10 minutes. Once cooked, add the onions to the baking dish along with the chunked fish. Toss to mix everything together. In the pan that the onions were cooked in, add the butter. Cook until melted and then add the flour, stirring quickly to combine. Cook the flour out for around five minutes, and then add the milk in, a little at a time, stirring constantly until smooth. Keep adding milk until you have a sauce of the texture you desire. Add in most of the cheese and cook until melted. Stir in the peas. 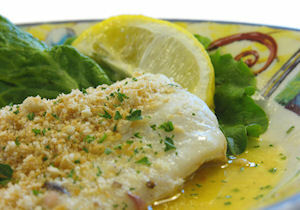 Pour the sauce over the fish in the baking dish and then sprinkle the remainder of the cheese over the top. Cook the pie for half an hour or until everything is fully cooked. This recipe combines tasty vegetables with haddock, all cooked in foil pouches for optimum flavour. Serve with fluffy boiled rice. Serve this delicious fried fish with some homemade chips. Season with salt and vinegar to serve.